Kingsbarn Funds provides passive investment income for high-net-worth individuals, family trusts, foundations, and institutional investors. We offer an array of investment options that best match your individual risk-return profile. Our structured, real-estate-centric, debt and equity funds are secured, either directly or indirectly, by commercial real estate. Investment funds fall into two categories: income and growth. An income fund provides investors with consistent monthly income from either dividends or preferred returns, while a growth fund seeks to grow the original sum invested as much as possible or by a set amount. 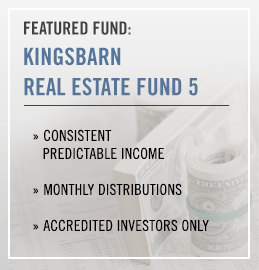 Kingsbarn provides investors with real estate investment funds that allow investors to accomplish these objectives. Our funds are always secured by the underlying real estate assets or the ownership interests therein. Kingsbarn Funds are proprietary and are managed by the company. Through its direct management, Kingsbarn is positioned to exercise the oversight and control necessary to pilot each investment. We apply sound real estate fundamentals to achieve competitive, risk-adjusted returns for our investors. Kingsbarn's management team has provided structured real estate investments for over 10 years. Our principals have offered and placed co-investment positions in over $2 billion of commercial, income-producing properties. Our diverse backgrounds in real estate encompass vertically-integrated, ground-up development, syndications of structured investments, financing, brokerage, and property management.